For our Hungarian friends, Zoli and Viktor, Austria is the country of gold standards against which all others are compared. In their view it has the cleanest cities, the purest air, the most delicious cakes, the most efficient transport system and the loveliest countryside. And, if these were not riches enough, Austria lays claim to Vienna, their idea of Mecca for contemporary design, stylishly dressed citizens and, at Figlmuller, the home of the original and best, of course, Wiener Schnitzel. Fluent in the German language and well read in German literature, the Fiúk [the Hungarian for 'boys'] as we fondly refer to them, live by the Germanic motto of form and function. Have nothing unless it is designed beautifully, works perfectly and, preferably, is made in Austria. Their carefully arranged, spacious and airy apartment is testament to their beliefs. Furnished in a minimalist style, painted with a restrained grey and white palette, the only nod to a Mediterranean influence is the shiny, lipstick red and chrome Italian coffee machine delivering Italian espressos in Italian cups with Germanic efficiency. And so when an outdoor film night was proposed, we suspected that the very latest in technological equipment would be employed to convert the boys' extensive terrace into an art cinema of which even the most discerning Austrian could be proud. We were not to be disappointed. At the flick of a wrist, a white linen blind turned a wall of windows into a wide screen and under an inky black Budapest sky we watched 'The Secretary' in high definition. Later, and after the credits had finally rolled, a blazing fire was projected onto the screen in order that none should feel the cool of the night air as we talked into the small hours and marvelled at the wonders of modern technology. Just last Friday evening, we hosted our return film night. This time an ancient white sheet shrouding a Victorian bookcase served as a makeshift screen. No matter, we thought, as surely Visconti's 'Death in Venice', based on the novel by Thomas Mann, would dazzle with its brilliance and its Germanic roots, if not its somewhat Heath Robinson production. I've always wanted to visit Vienna for its architecture, but what of its people? I wonder what your friends think of them? Ah, I must say that I prefer the homely touch, although I always admire minimalism from the outside. As I lament the sad demise of my (previosly)trusty washing machine, this post left me hankering for some Vorsprung Durch Technik! There is beauty in simplicity and function, and I admire those who apply this philosophy to their entire lifestyle. We could learn so many lessons from your friends. How beautifully shot that clip was, I really enjoyed the music too. How innovative! I don't have any technical no how to offer such viewings, it's just a ropy old DVD player at ours but I aspire to a bar/screening room decorated in the style of the Fumoir at Claridge's. The architecture in Vienna is indeed worth seeing. Much has been beautifully preserved from the past but, also, there is much modern architecture which is equally stunning. When we are not adding more to our already maximalist interior, we toy with the idea of stripping it all out and having just a few well chosen, ultra-modern pieces in each room. However, our principle of 'if one thing comes in, at least two must go out' rule has long since withered on the vine!!! It is true that Viktor and Zoli apply the principles of simplicity and quality to many aspects of their lives. Whether it is applied to the food they eat, the clothes they wear or the decoration in their apartment, they maintain a disciplined approach which we absolutely admire. Well, dear Tabitha, take a leaf out of our book. Throw a large sheet over something, turn the lights out, smoke and mirrors......and there, the Fumoir at Claridge's will be in your drawing room!! Whoa, that coffee machine! Fantastic-sounding evening you had. As for the Austrian people, well I don't know that many but my best male friend is Viennese and the most laid-back, good-natured,funny and devoted person..he's now back in Vienna with his fiance, equally great, and his best friend, ditto. So I think Austrians are lovely! She is long departed, but she did minimalist with Victorian furniture. Not the oxymoron you may think. It worked very well. As a gay person, I felt obliged to watch Death in Venice many years ago, a classic movie. It was very good. Well done you to screen it. The coffee machine is, we can testify, absolutely wonderful and the coffee too. Zoli in particular spends much of his working week in Austria and always talks of their very professional approach in business. My Father-in-law grew up just outside of Vienna on a large farm. Sadly the whole family had to escape in 1938 and he has only returned once, but it was quite painful. We do have man treasures in furniture and art that they somehow managed to bring with them. Vienna is high on our list of places to visit. I loved that clip, the music in it is very pretty. Very inspiring, your movie nights! We saw 'Death in Venice' when it first came out and have watched it many, many times since. Iconic, in our view too, and a film of which one can never tire as there is always something new to discover with each viewing. And, of course, we love Mahler! What fabulous evenings! I am also a subscriber to the mantra that your friends have. It must be beautiful and practical at the same time, howver the odd thing just slips in because it is beautiful and for no other reason! Death in Venice, one of my all time favourite films! I would not expect any more! How very interesting that your in-laws had to leave Austria and, yes, we can imagine the distressing memories that there would be in returning. Having, no doubt,learned so much about Vienna from your relatives we are sure that you would find a visit there absolutely fascinating. It is such a stylish city and with so much cultural interest as well as very fine coffee houses!!! Yes, we can well imagine, recalling many of your stylish and beautifully presented blogposts, that you would share a similar philosophy to that held by Zoli and Viktor. 'Death in Venice' did we feel win the evening wonderfully well, whisking us well away from an old sheet and a Victorian bookcase to the Lido.....!! My dear Jane and Lance, how delightful that you managed to spend time together with Zoli and Viktor. Have you both been converted to the wonder of techonologies and gadgets? Yes, it has a lot of benefits to modern living. In particular, I like the grey, burgundy red and black, colour-coordinated in the coffee machine and the interior. Visconti's Death in Venice, well, my dears, what can I say? It's my all time favourite film. It's a work of genius! Visconti's style is sumptuous, decadent, lavish and lush and he was also a perfectionist and he had an amazing eye for details! The architect, Ludwig Mies van der Rohe once said that "God is in the details". Well done for hosting such a great artistic film for your film night. I wonder what film you might be hosting next. I have to recover, here, from watching that very peacefully horrific death on the beach. I suppose that one of the days I should read "Death in Venice"? The sleek and minimalist modern style is so fascinating to me. I appreciate it - it's a wonder and, sometimes, gets a gasp of appreciation from me because of its beauty. (I don't gasp for everything. =])I just can never understand how people, actually, live in it. It seems so cold. I, obviously, love cluttered and cozy and soft. Isn't it wonderful (to state the obvious) that there are so many different kinds of people and creativity in the world? I mean, it really, truly is wonderful! Well, I was just on my way to visit you, first thing, this morning and opened up my list and there you were - at the top - with this post. I was just on my way, almost a month ago, to thank you for your words on my garden post, when I was interrupted by the deluge and the extra week home for the kids. I can't tell you what an encouragement and a thrill it was to hear your knowledgeable words of encouragement and appreciation for my start on my garden!!! =] Now, I have a million other photos of delphiniums and roses to go through to share the update. I need to let go of my petrifying perfectionism, I think. Well, I've missed two other posts; so, with more coffee in hand, here I go to read on. We see Zoli and Viktor quite frequently and always have such fun together. Our own style, however, is not theirs at all. Film Night on the open terrace in the winter may be something of a challenge, but we are certain that if there is a technological solution it will be found!! Yes, for us too, 'Death in Venice' is a favourite, certainly within our top ten. So many elements which are intelligently and beautifully brought together to make a magnificent whole. It may well be a trip to Wales with 'Very Annie Mary' for our next showing. If you do not know it, seek it out as it is a gem!! It's, also, a coincidence that you mentioned Austria. I was just there all of Monday night and yesterday (in my mind, that is). I've joined the little local choir. We're singing a version of the "five days of Christmas" that starts with Gregorian Chant and moves onward through musicological history. The Fifth day of golden rings is in the Austrian style. Our director was calling it Mozartean but I think it's much more - Elizabeth Schwarzkopf and stylish, well tailored outfits and cowbells ringing from steep mountainsides have been in my head since. It's just such a funny coincidence, I thought I'd share. Austria is beautiful place! ^^ the coffee maker is cool! There are so many wonderful moments in the film that it is problematic to select just a small clip but this final scene is so poignant and accompanied by such wonderful music that it was a natural choice for us.Although faithful to the novel by Thomas Mann, for us the film not only tells a story but also reaches into the depths of one's emotions, even into one's soul. We were thrilled with how your garden was developing and were so relieved to read that you had been spared much damage from the hurricane. It is so depressing when one has worked so hard if all that is swept away. We are sure that in the spring it will be looking much more established and will reward your many efforts. So many treasures awaiting you here in Central Europe. Hurry, hurry....!! Love Austria too, mainly for walking in the mountains, and staying in the pretty chalets. The cabinet for the specs, I have to say, reminded me of my visit to the Opticians this morning. We were acquainted with Elisabeth Mann Borgese, the youngest daughter of Thomas Mann, she worked in the same field as my husband. I must admit I would feel slightly uncomfortable watching The Secretary amidst all that minimalism it would probably be enough to set off a latent OCD. No, I think I would be much more comfortable at your place watching Death in Venice. A coincidence indeed that Austria should be featuring so heavily in your mind at present. Your choir sounds delightful and how interesting to be learning about music from so many different periods. We try to focus on Mozart whenever Austria is mentioned in relation to music but, irritatingly, we tend to get sidetracked by those all too catchy tunes from 'The Sound of Music'!!!! The coffee maker......not "so vintage baby" but wonderful nevertheless!!! We are so pleased that you like Austria too! I have always wanted to go to Austria. The magnificent scenery, the music that defines it, (and as you mentioned, the delicious pastries) have made me want to hop on a plane and experience this country's culture many times. Maybe someday. It sounds like you had two very lovely evenings with your friends. I have not seen either of these films, but will check them out, especially Death in Venice. Which one did you enjoy more. The Austrian countryside is indeed most dramatic and very pretty. We are pleased that you like it too. Viktor's spectacle collection is his pride and joy and he has a pair made by a Hungarian designer who incorporates small clips of old film reel into the design. How intriguing that you knew the daughter of Thomas Mann....now you have us wanting to know more, much more!!!! Well I see another delightful post, Zoli and Victor sound wonderful and who could fault their love of form and function. Having spent many happy times in Berlin I have a great affection for that beautifully crafted functional efficiency that is central to good German design. Having said that, as you know I have more than a passing interest in all things coffee and German efficiency aside I have to say that the Italians have cornered the market in coffee perfection. Film nights are such a lovely way to entertain, whilst indulging in and sharing ones pleasures. I've recently hosted Swedish and Korean themed movie nights though have had to make do with more limited technology than your dear friends. Death in Venice is perhaps my favourite Dirk Bogarde film, brave and cutting edge for it's time, beautiful in it's 'form and function' of course in Mann's novel Dirk's character Gustav is a novelist and not a composer, but the nod to Mahler is brilliant. My favourite story about this movie is to be found in Visconti's autobiography where he tells of screening Death in Venice to some studio executives in LA, after the movie finished they sat stunned horrified silence, eventually one exec says "Signore Visconti, who is responsible for the score of the film." Gustav Mahler" Visconti repiled. "Just great, I think we should sign him" was the response. You mention a top ten list of films, I'd very much like to know more about those choices as it is the other nine are in very good company. Your friends sound to have style "stamped through them, like stick of rock"! Having watched your clip, I shall endeavour to get "Death In Venice" from the library. We rather think that one would be more than slightly uncomfortable watching 'The Secretary' wherever one happened to be!!!! A perfect choice, however, we thought whilst surrounded by the black of night. Of course, for us, Austria seems just a short step down the road and we are able to visit frequently. We feel very lucky to be able to do this as there are so many wonderful museums in Vienna and the exhibitions they show are always of such very high quality. We hope that you too will be able to make the journey one day. We should be at a complete loss to know how to compare these two films in any way. Both, we would suggest, are disturbing rather than enjoyable but in very different ways. Still, it is exciting wondering what will be selected by 'The Boys' for the next film night!!! Oh, Berlin, we really wish to go there and, with daily trains, we have no excuse. One day soon!!!! Zoli and Viktor are indeed great friends to have. Keenly intelligent coupled with a devilish sense of humour, time spent with them is never dull. We are sure that you will know of 'Tre Forze' coffee which we were introduced to by Zoli and Viktor who, like you, take their coffee seriously.It tasted delicious but we had never heard of it before, although just one look at the glamorous red tin and we were hooked!!! How we love your phrase 'style stamped through them like a stick of rock' and how appropriate! Yes, Zoli and Viktor are discerning in so much of what they do and what they have. Perhaps because in their early childhoods choice was heavily restricted and generally what was on offer was of poor quality, that has made them much more selective and discriminating in the 'New Hungary' of 2011? Whatever, we are the richer for their friendship. I loved Vienna when I was there as a troublesome twenty year old. So much charm, beauty and a quite energy that tingled the senses. Sounds like wonder film night! So wonderful, Death in Venice is so remarkable, on so many levels. What a delight and treasure. Vienna's Spanish Riding School is, justifiably, world famous and is situated in a most beautiful building which is part of the Hofburg. We have never seen inside but can imagine that the sight of these wonderfully, classically trained horses is amazing. Yes, Diane, certainly reason enough alone to visit Austria! I was in Vienna only the once, back in the mid 80s when I spent a week and a half there, drinking in the cultural delights (principally music), without once going outside the city - well, apart from the obligatory boat-trip on the Donau. Even though I lack a discerning eye for the visual arts even I found the architecture grandly impressive. I have a nephew (now of 40 years) who's lived in Vienna for 10 of those years - and yet still can't speak German! (Oh, despair!) But he gets by, having a steady job in a gardening company - and makes money on the side by playing flute on Viennese streets with a plate on the ground before him for tourists' monetary appreciations. - Oh, and yes, he's got a licence from the city authorities to do this. Btw; Re 'Death in Venice' - a complete pleasure for me is to watch the film on a comfortably warm Summer evening whilst supping a glass or three of sweet white wine. Now that is perfection! Yes, by Austria doesn't have an ocean! A troublesome twenty year old....well, we hesitate to think what you got up to in Vienna. Still, it obviously left a good impression with you so perhaps as a [less troublesome??!!] more mature person, you might make a return visit one day? It, Vienna that is, is as glamorous as ever!! Jane and Lance! I'm heartbroken to have not been invited to the viewing at your home! Our family is professional at taping bedsheets up to project a movie on or play a video game. Movie nights with friends are too! Vienna is a place of wonder, certainly, if for their elf-made fingers. (Vienna Fingers are a cookie in the US made by Keebler Elves - yes, that's how limited my experience is - elves and cookies). It does sound like another lovely adventure that I've loved sharing with you. I’ve had a trip to Austria - Innsbruck, Saltsburg, and Vienna. Vienna people looked more stiff, more formal, and more friendly to Japanese, compared to those in other cities. I loved the atmosphere of the city and would like to return when possible. Recently I’ve tried to refrain from buying not so as to increase my personal belongings while I treasure handmade authentic things. Really functional thing is simply made, pared down to the core. I like the lifestyle of your friend. Hi my hubby and I love Austria and the wonderful mountain air. W are on holiday in Rouen France this week and are seeing plenty of beautiful places, yesterday we were at Monets garden, today Rouen and tomorrow probably Honfleur. I am not a great film watcher as I don't like cinema's very much but how your friends set it up sounds wonderful. I am trying to be a little minimalistic in the house but with a new grandson it isn't going too well!! Bye for now from Jackie usually in Surrey but today in Rouen. Landlocked she may be but surely Austria is a Grande Dame of the Ancien Régime, n'est-ce pas?!!! It looks so lovely,peaceful and serene.Thanks for sharing! What a gorgeous post! Oh, I wonder at what beautiful things I could pen if I led such a sensual and vibrant life as the two of you do! Years ago, I told my sister, if you don't use or love it-- don't keep it. She has often told me that the simple dictate has consistently informed her decision-making process. I think what I love best about this post is two-fold, though, truly I simply can't gush enough about it. No, sorry. threefold. No. 1-- the lipstick-red spot of color amidst the studied palette of whites and greys. And here I get a bit personal-- the bedroom I share with my husband is virtually entirely cream but for a sable-colored pillow. No. 3-- Vienna. I have never left North America. I am resolved to go to Vienna first the minute I begin reaping the benefits of a successful publishing career. You sound as if you are professionals at rigging up makeshift cinema screens, we could certainly have done with your advice. After several goes and pin holes in the furniture we were rather proud of ourselves, the Boy Scout and Brownie training came in handy after all we decided!! Well, we had never heard of Vienna Fingers and were so intrigued that we had to look them up. These vanilla flavoured confections certainly have had a long history so they must be a popular snack. Elfy eating, perhaps? One needs to see no more than that glasses case to know your friends' great style. I would love to visit Austria and Vienna in particular some day - lucky you for having friends there! What a wonderful way to spend an evening with friends, Jane and Lance. I haven't seen THE SECRETARY, but I have seen DEATH IN VENICE with Dirk Bogarde in the tragic lead. Bogarde was wonderful. And the whole film had such a moody sense of dread about it. Thanks, as always, for sharing the bits and pieces of your intriguing lives. We were most interested to read of your perspective of Austria and Austrians as a Japanese tourist. We have to say that, on the whole, we would tend to agree about the degree of formality shown in general. Certainly, far more formal than in Hungary. Your views on living more simply and trying to only buy things which are handmade and authentic are so inspiring. It is so true that we can all live with far less and to support artists and creative people needing to make a living from their own endeavours is, in our view, very important. Well, it is through the wonders of modern technology that whether you are in Surrey or France we can be in touch! We love Normandy and Honfleur is a gem. Rouen Cathedral is marvellous and, although we have never been, we are sure that Monet's garden will have been a delight. You must be having a lovely time. We love going to the cinema and are spoiled for choice with Budapest's many wonderful Art Cinemas. However, film night under the stars on the terrace with Viktor and Zoli is the best of film watching experiences. Austria is a country of the most wonderful contrasts.Stylish cities, fabulous countryside, wide open spaces,mountainous regions, summer sunshine and winter snow. Lovely! 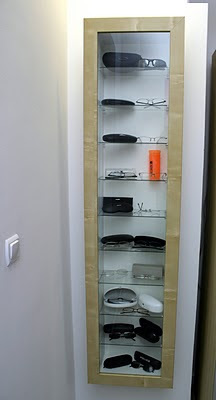 The architect in me is loving the tidy, minimalist organization of Zoli and Viktor--I LOVE the spectacles case--we all should have (at least ) one. Austria is one of the few European counties I have been to and, until I moved to the Pacific Northwest, I had not seen such natural beauty. As for the movies...I now know what to rent next! :) Thanks for another fun and fascinating post! Dearest Suze, how kind and generous you always are but, no,no,no we could not condone a visit to Austria before a visit to Budapest first. Then we shall all go to Vienna together!! The splash of lipstick red reminds us not only of Zoli and Viktor's apartment, not only of momentary scarlet flashes in 'Death in Venice' but also of that other iconic film of Venice 'Don't Look Now'. If you do not know it, we urge you to see it!!! It is so curious that you have never left North America and we have never seen North America. Although physically there is an ocean separating us, there is not so much as a droplet coming between our minds and spirits. One day, we are certain, that even the physical distance will be bridged. We shall play your favourite song as soon as we leave the keyboard and shall think of you as its sound fills the room in the golden glow of a late summer afternoon in Budapest. Fairy godparent wishes are coming your way.....!!!! I am in total agreement with your friends Zoli and Viktor. 20BC (aged 20, before child), I had two skiing holidays each year in Austria. The snow conditions were always perfect and the scenery breathtaking. Après ski party's were great fun too. I also owe my life to a rather dashing Austrian ski instructor who came to my rescue on a black run. Zoli and Viktor have a collection of the very best quality eyewear, and I would be very interested to know where they sourced their wonderful cabinet from. The shop fit for my husbands new optical practice is still ongoing (I am going grey with this move!). I could see something like this fitting in very well with the interior design we have planned. I would very much like the coffee machine, but feel I will not get my way with having one of those installed too! Throwing a sheet over your bookcase to allow you to watch Death in Venice with your friends is simply ingenious. And what a wonderful choice of film too. It is many years since I watched it, and after viewing the clip, feel I must see it again soon. Thank you both so much for your lovely comments on my post. Harvest is a great tradition, and one I really enjoy taking part in. The weather here is very autumnal, so I was pleased to read that you are still enjoying the warm days in Budapest. We are delighted that you like the case of spectacles too. We find them fascinating and so beautifully arranged as one might expect. Yes, we are sure that you would love to explore Vienna. Such an interesting and beautiful city. We thought Dirk Bogarde was wonderful in the film, possibly for us his greatest role. 'The Secretary' is INTERESTING, one might say, although not for the faint- hearted. Maggie Gyllenhaal is terrific. I doubt your makeshift screen detracted from the evenings entertainment. I don't think everyone has the capacity to be minimalist. For a start one needs to be tidy........ that's me ruled out then! Once tried to have a minimalist interior--it had an extremely brief lifespan! Admire it but am totally incapable of living in it. Do fancy that superb espresso machine...can almost smell the coffee. Yes, we too think that the spectacles cupboard is a wonderful idea, although we should certainly have to obtain some more interesting specs than we currently possess to make a decent display. And, we totally agree about the natural beauty of the Austrian countryside, so many unspoilt areas and so many places free of 'madding crowds'. 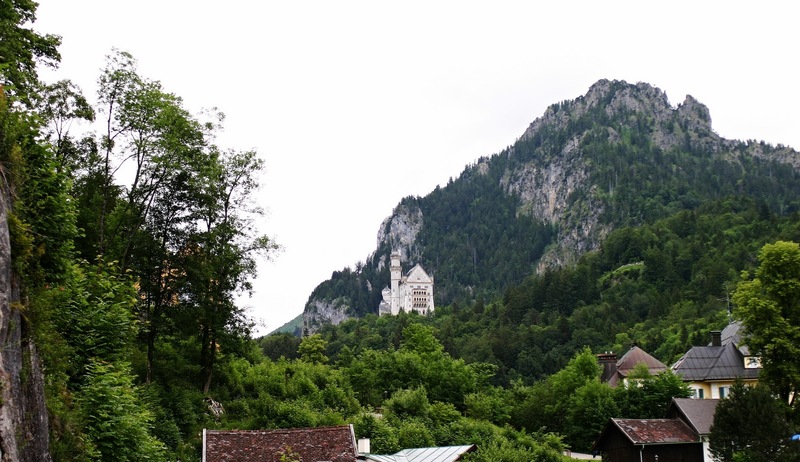 The castle, Neuschwanstein, as you rightly point out in your email, is in Germany but very close to the Austrian border where 'The Boys' were on holiday. Such confusion we have caused here, but not surprising given our terrible knowledge of Geography. Whatever, thank you for telling us and how very interesting that you have been to Austria. Perhaps we may tempt you across the border to Hungary one day? Good design is not an absolute--there is also the element of appropriateness. Watching Death in Venice on a "white sheet shrouding a Victorian bookcase" seems the perfect venue, more fitting than high-tech perfection. Gosh, what wonderful tales of Austrian ski slopes, handsome instructors and after ski parties. Clearly you too have enjoyed happy times in Austria. 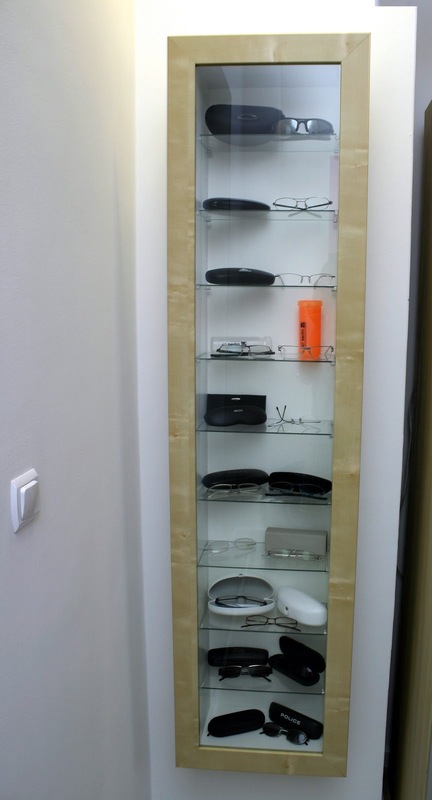 We cannot be sure about the spectacles cabinet but think that it may have come from IKEA [Scandinavian design is also a favourite with 'The Boys']. It does, as you say, contain some iconic eyewear and so is well worthy of being displayed so stylishly.How very interesting that your husband is an optician. 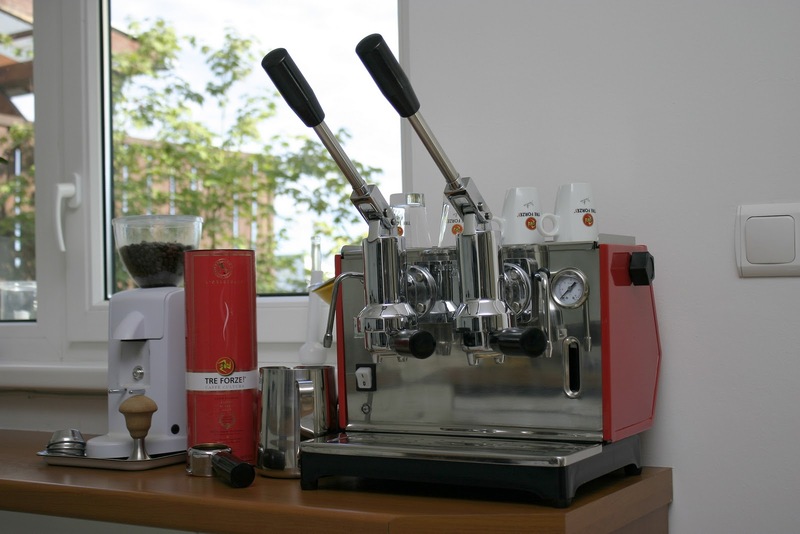 We are sure that an all singing and dancing Italian coffee machine would go down very well in his new practice. Our erstwhile optician in Herefordshire had the most dingy of premises, but perhaps, that was the quality of our spectacles!!! Although it is evening now in Budapest our windows are wide open. We shall go to a 'farewell to summer' party on Saturday. Then autumn really will have arrived!! Yes, it was wonderful watching the film lit only by starlight and on a particularly warm night. We were also introduced to 'Tre Forze' coffee which is delicious!! We agree that some people, ourselves included, seem incapable of adopting a minimalist approach to anything. Tidy we are but also collectors and therein lies the problem!! We do not think that we have ever attained or even approached anything which could be remotely called 'minimalist', but when we see Zoli and Viktor's apartment and all that white space it does make our minds turn to bonfires!!! It is very kind of you to say so, but when the drawing pins slip part way through and, at times, the picture sails across a nearby painting.......!!! You certainly see life. Death in Venice, one of my favourite films. What a perfect atmoshere to watch it in. I love your friends coffee machine, what a beauty. Oh Jane and Lance, you described the nights spent with your friends so beautifully, i feel like i was there with you. The choice of films is great too. And i am jealous that the weather permitted sitting outside. It all sounds very European and while i love living in London, you made me miss good old Europe. Your friends home looks very stylish! It must have been great spending an evening in such a beautiful apartment in the company of your friends. I think I would have preferred your home though ;-)! I must admit that I have never seen this film by Visconti's. I just watched the trailer. The music is simply beautiful, but it looks so sad! I am not that much into sad films at the moment. Just watched Lars von Triers Melancholia....which is enough for the time being! Well the song is not my *absolute* favorite, but it's certainly among them. And I think you might favor it, too. All right, so now I have 'Death In Venice,' and 'Don't Look Now' to add to my growing list seeded with 'Touch of Evil,' of Hattat-recommended films! Death in Venice is such a wonderful film and the Mahler symphony - well its just divine and never fails to move me. Good choice for your return film night. Well, an outdoor film show on a private terrace was a first for us and we were simply amazed at how one minute we were being served a delicious alfresco supper and the next we were in an Art Cinema! I'm sure I spotted a little Scandinavian mass-produced, flat-packed 'design' there too. However, I do admire anyone with a coffee machine like that in the kitchen. Sacha Torte also belongs to the Austrians, I believe. Strangely enough, also the Danish pastry which in Denmark and Norway is called Wienerbrød. We often project films or slide-shows straight onto the clapperboard walls on balmy, summer evenings - so your sheet sounds positively sophisticated in comparison. Thanks for the film clip. It is, as you say, so essentially European to be outside at all hours of the day or night until the last of the summer heat has gone. Tonight we could still be sitting outdoors as it is a wonderfully balmy evening,but not for much longer we think.Sigh!!! We should, if asked, place 'Death in Venice' in our top ten films of all time and so we really recommend that you see it. And, if it is the book or the film, then we should opt for the film!! As we love anything even remotely connected with Venice and as, in our view, Visconti can do no wrong, then you can easily see how 'Death in Venice' is a film that we rate very highly indeed. But sad, oh yes, deeply sad on so many different levels. What is so interesting about seeing inside other people's homes, we find, is the infinite variety of ways in which people decorate them. This surely is the spice of life!! Austria has much to recommend it.....as well as rather a dark past. Where hasn't?! Ah the Tyrollen Arbends (spelling!) I have lived through -such splendid posterior slapping. My most recent foray into things Austrian was reading The Man without Qualities which was rather a challenge. Well, we hope that we got the link correct and ended up with Billy Joel's Vienna. We did enjoy listening and how cleverly it matched this post!!! Some of the lyrics we also found to be pertinent thinking of your current struggles with the whole literary process. "Slow down you crazy child.....slow down you are doing fine......you have your passion you have your pride.....only fools are satisfied......Vienna waits for you"!!! We would have replaced Vienna with Budapest but it did not scan!!!!! We are so pleased that you agree about 'Death in Venice' and yes, the music of Mahler is divine, simply divine. Although we can recognise minimalism when we see it, achieving it is quite beyond us!! There always seems to be a little something else which just creeps in.We love your cottage which is the perfect evidence of your painterly eye. I hope you enjoyed 'Death in Venice', so achingly bittersweet. 'The Boys' have quite a soft spot for IKEA which, we must say, we have never quite developed in the same way. Sacher Torte, the famous chocolate cake is said to originate from the kitchens of the Hotel Sacher in Vienna. The recipe is still meant to be a closely guarded secret but one could stay at the hotel and spy!!! We rather like the idea of film screenings on the sides of houses. That certainly does take the term 'wide screen' to a new level!!! Gosh, Jane and Lance, I'm impressed by your vorsprunging. You always portray yourselves so modestly as strangers to the cooker and the sewing machine, and yet here you are dabbling in film projection. I can only surmise that it is the cultural element that drives you to this conspicuous success, and am settling down now with a small port to ponder the matter of what classic film I shall show on the western gable wall when you visit. We are most intrigued by your mentions of evenings of 'posterior slapping' in the Tyrol. Could this have anything to do with 'lederhosen' we wonder?!!!! Even the title 'The Man Without Qualities' suggests that, perhaps, there may be heavy work ahead. We have not heard of this novel but are intrigued to seek it out. Our most recent foray into things Austrian was a Wiener Schnitzel at the legendary 'Figlmuller' with an exceptionally good potato salad. Now that we can heartily recommend! We rather like to feel that we have a wide circle of friends both here and in England, many of whom know each other whereas Edith, we feel, perhaps prefers to compartmentalise her friends. 'The Boys' are indeed great fun and we have now enjoyed many impromptu events in their company. It is always so interesting when one has friends who share one's interests and yet often view things from a completely different perspective. Life is never dull with them, that is for sure. We do so hope that there will be more film nights to come, although we may have to retreat indoors before too much longer!!! What a great way to spend an evening! We also watch movies along with our friends, but we don't have a sleek system as your friends Zoli and Victor. But don't you think if you are watching a great movie like "Death in Venice", even watching it on a 16" television will be a great experience. This really made us smile, Faisal, as your comment prompted other memories. The days of garden talks in village halls the length and breadth of Britain with our trusty slide projector. All was well until the night of the STUMBLE and the spray of slides in the air which never did go back in order. Another post on another day!!!! We are so pleased that you share our love of 'Death in Venice'. How perfectly you describe it! Well, we omitted from our story the fact that prior to the film showing at 'The Boys'' apartment, Viktor had produced the most delicious supper as he is a talented cook. On the return visit, choc ices were the order of the day.....we felt that it added a certain authenticity and it was Timea's day off!!! And what, we wonder, will be projected on the wide screen of the western gable wall.....whatever, we shall look forward to a nip of port in the interval!!! Well, that was certainly our thinking that surely 'Death in Venice' would win the day whatever it was projected on. As for a television, we have not had one for 30 years!!!! If only 'well-made' could be found anymore. I often opt for old furniture because of that, it's better made. Yet I love contemporary style. How are Austria's skies? Any good for a stargazer? We can well imagine that in many areas of the Austrian countryside, stargazing must be perfect without the light pollution of densely populated areas. But, we would need your marvellous telescope!!! And yes, well made. We should be happy to settle for that too. Austria has long been on my list for places to visit. I only wish that I had some down time to take a prolonged trip to Hungary and Austria. For now I must just read your always interesting blog. "Death in Venice" was a great film...but by far not the best book by the brillian Thomas Mann. We should love to think that when you have the opportunity you might explore the riches of Central Europe. Treasures await you!!! We totally agree with you about 'Death in Venice'. This is an instance when the film wins hands down in our view. No, it is not to be.....for we shall steal it first!!! Wonderful friends (and I do love that coffee machine) and great movies--not to sound trite, but life is good, yes? I have never been to Austria. I'm a little messy, always spilling things. Would they let me in? How wonderful...an outdoor cinema event, it must have been super. I don't think I have ever seen this film although I am familiar with the book. You will not believe this but this evening I returned Downton Abbey to the video store and looked for "Death in Venice" which was not available. Talk about telepathy!!! I did, however, see "Death in Venice" the Benjamin Britten opera, just last year at the new Toronto opera house.It was spectacular!!! Your friends Viktor and Zoli must be a very interesting couple. I just love the idea of a film night, it is sort of like a book review, and no doubt interesting discussion follows. I travelled through Austria, on business, in the mid 80's. I loved Vienna and had a free weekend there. P.S. Downton Abbey is worth seeing. PS I absolutely loved your comment on my blog about purchasing a 3 storey building in Ireland...brilliant penmanship! Hi Jane and Lance, both movie nights sound delightful, wish I could have been there. I'm ignorant about the whole Austrian Hungarian Empire but find it endlessly fascinating. I love the red Italian coffee machine! Vienna (and Salzburg) are also on my must-see places list. Trying to squeeze a comment in down here...can you read it or is my print too small? My sister in law and husband are traveling in Germany and Austria as i write this and the photos she insists on sending us of the Viennese pastries bring tears to my eyes. What a wonderful way to spend an evening in Vienna. While I would love to enjoy the modern technology you describe, there's something very charming about a sheet serving as a makeshift screen while viewing "Death in Venice." I just viewed the clip...thank you! You are absolutely right, life is good for so many of us and we are so fortunate. The coffee machine is rather splendid but we doubt that we should know where to put the water, let alone the coffee! Austria is an exceedingly pretty country and we are certain that it would appeal to you. One day, perhaps? A private outside cinema viewing was an absolute first for us and, as it happens, it was one of those wonderfully warm summer evenings which made it particularly enjoyable. Although 'The Secretary' and 'Death in Venice' are completely different, we should highly recommend them both to you. That is quite remarkable, and not a little bit spooky!! How wonderful to have seen Britten's 'Death in Venice', seldom performed, we think, and we are sure that it must have been the most splendid of occasions. We have only ever seen his 'Peter Grimes' and 'Billy Budd', both of which we thought fantastic. Part of the interest for us in seeing a film, or indeed reading a book or similar, is to be able to talk about it afterwards; it is so interesting to discover how people view the same thing in such different ways. Alas, without a television, 'Downton Abbey' continues to pass us by. Perhaps it will become a film. The history of this whole part of Europe is, we feel, so very fascinating. It is strange to think that before the First World War Vienna was the very centre of a huge Empire and then, after the Anschluss, it was for a while secondary to Berlin. Today it is a city well worth visiting, not least for its art galleries and museums. You are absolutely right. And yes, if the world has to die, let it be with style, to which we should add function and form, all of which may be immediately found in Austria and, we suspect, Zoli and Viktor's apartment! Most likely too at Fox Paw Lodge, although we are less sure about the Aladdin's Cave!! We do agree, Linda, about the spectacles' cabinet and if we could muster up a sufficient number of 'designer' spares, then we should be tempted to copy. Those old National Health ones do not give quite the same effect. The coffee machine is hugely impressive and rather leaves our own cafétiere standing on the starting blocks. And, we suspect, the coffee comes at the price of the National Debt. Oh well....! Austria is a really beautiful and well ordered country. We are sure that you would enjoy it whatever the season. As for the coffee machine, yes please!! How splendid to be receiving postcards directly from Austria at this time but, we do feel, a little hard to be tempted with so many of the delicious cakes which, in all probability, you are not going to be able to taste. Unless of course there are plans to have some of them boxed and brought home as a gift for you. We do hope so!! Alas, we think there is little chance of our becoming totally absorbed in modern technology. We recognise when enough is enough. How kind of you to comment so encouragingly and generously about the sheet; we suspect that Zoli and Viktor were not over impressed but were too polite to say. Writing a profile of them in the form of one of your beautiful Posts is another form of beauty too. PS. As a reminder here is the little Post I wrote about the film. You already left a comment then. It is true that Austria is a very lovely country and, seemingly, a very efficient one. But, as you rightly say, there are many, many others, too many of which, sadly, we shall never visit except, perhaps, through the blogosphere. But we do all have that. We are so pleased that the film is a favourite of yours too. Oh that coffee machine! What a joy. Clever chaps for ensuring they have decent coffee on tap. Just last night we were watching something on TV, set in Vienna, and I remarked how lovely it looked and how it would be a good place to put on our list of "Places to Visit." Now, even more so. Like you, 'Death in Venice' continues to haunt us both in terms of the excellence of its production and its brilliant direction. As for the Mahler, that in our view absolutely makes the film and, no, we had not realised that he had died in Vienna. We shall certainly pass that piece of information on to the Fiúk when we see them at the weekend. We do recall vividly your post on the film and will now, happily, return to reread. We do agree with all that you say about the coffee machine. If only we were that tiny bit closer, then we should in all likelihood be popping in quite frequently. Yes, do try to visit Vienna which is a lovely city but not, we hope, before you have seen Budapest! In the midst of making a short film of my own - and have to add that this clip was most inspiring. Thank you! Well, my dears, I am totally and utterly flabbergasted. Austria cutting edge modernist and efficient? Charming, elegant Vienna, beautiful scenery, delicious food and the most melodious version of German, yes, I grant the boys all those. But uncluttered Vorsprung durch Technik? Austria and the Austrians must have changed vastly since the last time I looked. How very intriguing all of this sounds. We do so much hope that we may, in due course, learn more on one of your future posts. Ah, we are not surprised to read this! Indeed, whilst writing the post images of a totally sympathetic but no nonsense Friko came into our minds at which point we wondered if the picture being painted was not, perhaps, a little too perfect!! But the boys do love it and, even allowing for our posting an image which is not, as it happens Austria at all(!! ), did produce many photographs and tales to support their view of this Never Never Land. But we are sure that you will understand why we, personally, choose Hungary over Austria. No "Vorsprung durch Technik" here. What a wonderful evening that must have been sitting under the stars viewing a movie. I used to have all antique furniture, now I love the minimalist style of decorating, but with a Florida pop of color. The photo of Austria is lovely I particularly like the white building in the distance; is it a church, a castle? Hello my friends. I visited Vienna quite some time ago, as a young New Yorker (and this during the period when NYC was still rough around the edges). I was so fascinated by the cleanliness of the streets that I could barely look at anything else for a few days! I was quite annoying, exclaiming "You could eat off them!" over and over. Finally, I did move on to appreciate the quiet calm of the cafés, Sacher torte and all of the gorgeous, swoony art and architecture. As for "Death in Venice", I am just too sensitive, I am afraid. I saw it once and it devastated me. Just to beautifully sad. Maybe it is something like Joyce that we have to come back to until we are ready for it! Yes, it was all rather magical and we shall hope to be able to do it once more before the colder weather sets in, possibly though draped in blankets. We are, we are afraid to say, anything but minimalist. More is more where we are concerned - doubtless to the horror of the boys. Yes, it is a castle but we have rather misled you for we know now, of all the boys' images to select, this one is of Germany - but very close to the Austrian border!! Like you, dear Heather, we are always struck by the utter cleanliness of Austria, and Vienna in particular. That somewhat over sanitised look is all a little too much for us. Give us falling stucco and the smell of cooked cabbage on stairways anytime! We love what you write here of 'Death in Venice'. You really are the most wonderfully sympathetic and appreciative and understanding of women. No, do not go back to it; rather cherish your thoughts and memories for all time. Thank you for your lovely comment on my blog. I used to be acquainted with a couple with not too disimilar tastes. Try as I might I'll never be a minimalist girl. When I trip over yet another plant stand I do have thoughts about minimalism...but they don't last. I love my clutter. Though what we are to do if ever we sell the mausoleum in France and try to fit its contents into the houses here is another matter.. I like a little decay about me and the architecture of San Jose provides it in spades. Minimalism is, we think, probably a frame of mind and either one's mind works in that way or it does not. We can empathise with you as, try as we might, maximalism comes so much more naturally to us!!! Yes, we do know what you mean about being comforted by 'having a little decay about you'. For us, that is why our hearts will always belong to Budapest rather than Vienna. Perfect in every detail has little appeal for us too, we much prefer the peeling stucco!!! May we offer our services for clearing the mausoleum? That sounds like fun to us. What a beautifully written post with such a brilliant video finish. Jerry and I, too, were known in the USA as the boys by many of our friends (even other gay couples); I wonder why that is. If not for the gay couples also thinking of us that way, I might have taken offense. And now one of our local waitresses calls us "Chicos." Your movie nights sound magical. What a coincidence that you were also called 'the boys' and, now, 'chicos' this all sounds very endearing to us.We, personally, do find the modern trend of being referred to as 'guys' exceedingly odd...!!! We are so pleased that you liked the film clip and yes, the film nights were enormous fun. Sounds like Austria has a right to hold the 'gold standard'! I completely agree with the motto to "Have nothing unless it is designed beautifully, works perfectly." Perhaps it is my Austrian heritage at work (that always was the artistic & practical side of my family tree). How interesting that you have an Austrian background. Perhaps as you say that means that the combination of efficiency and style are in your blood? We must say that we love the way that everything 'works' over the border whereas in 'uber cool' Budapest, there is always tomorrow.....!! Oh for such tidiness and order. The tidiest I achieve is moving the disorder from A to B and admiring A! Now that coffee machine has me so envious...I love the colour and the fabulous levers. How to make coffee with love! We have a Sunbeam! What lovely evenings you've all had and thanks for sharing them. Annie x. At this point in my arrival at your post, all I can do is echo the sentiments of those who have eloquently commented before me. So ever so briefly, this was indeed a most informative and fascinating read. The video most certainly added a deeply profound and thoughtful touch. I wholeheartedly agree with the "flük" about form and function. I've never understood how people tolerate ugliness in their surroundings. I'm entranced with the vision of a projected fire, or hearth, out of doors and can only imagine the film discussion with friends on a starry Austrian night. It sounds heavenly. But it is, of course, so enjoyable moving things around at home and then, as you say, admiring the result. The coffee machine is utterly splendid and totally professional producing all manner of different coffees of choice. Why be content with a latte? Your comments are always welcome, Gary, and thank you so much for this one. We too find those last minutes of 'Death in Venice' to be very moving, perhaps the Mahler, in a rather strange and sad kind of way. The projection of the blazing log fire came as a complete surprise to us but was, we can assure you, most effective and quite realistic. Whether minimalist or not, it is difficult for us, like you, to understand living in complete disorder. On the other hand, it may be truly liberating. 'The Secretary' is undoubtedly a film which is worth seeing although very strange and, at times, slightly sinister in what it reveals of human behaviour. 'Death in Venice' remains for us one of our all time favourite films; but then we hugely admire Visconti as a director. Fun....have not seen Death in Venice but my father, a film buff constantly tells me I am missing something.....guess its time! Love the idea of flim nights spent wtih good friends..how wonderful. Yes, Tina, you are definitely missing out if you have not seen 'Death in Venice'. A masterpiece of film making in our view but it does not make for the jolliest of viewing!!! Treat yourself to a film night without delay!!! What a sweet comment you made on LAWN TEA just now!! I so thank you for that, and for visiting. I cannot imagine the seductive mystery of the movies in the dark of the elegant terrace. My own reference points would be more lawn-chairs and projected-on-a-barn, but I do know the feelings of such gentle evenings, all eyes directed at the screen, as the story unfolds. And even now, it's difficult for me to watch a suggestive movie, even just us two at home---I wonder how the young folks of today choose one when they go on a DATE. says rachel, who tried to sneak out of THE GRADUATE with my purse over my head, so no one in our small town would recognize me. We have so laughed at the picture of your creeping out from the cinema under the shield of your bag having watched 'The Graduate'. Oh the inhibitions, concerns and embarrassment of youth! And, yes, it was such fun watching the film as the night sky darkened and the lights of the surrounding apartments gradually went out, one by one. Thank you for reminding me. I'll have to re-watch Death in Venice. I remember the last time I saw it - fifteen years ago - the beauty and sadness in it really consumed my imagination. Yes, beauty and sadness, 'Death in Venice' evokes so many emotions on so many different levels. We are so pleased that you rate the film. It is a definite top ten favourite of ours. Berlin is beautifully diverse and a perfect destination for soaking up art, history, great architecture, amazing parks with all those wonderful eastern block statues and of course great coffee houses, you simply must go. Indeed I've had the pleasure of having Tre Forze; a very special brew. I've only had it once though, in a small Sicilian coffee house in North London. Haven't been able to find it since, it was superb and I have to say that Zoli and Victor have exquisite taste in coffee. Who would have thought that glasses could look so stylish?! The "boys" definitely seem to have style down to a fine art. I am sure however that the sheet over the bookcase would have made for an equally fun night. Good friends wouldn't care about the "where" but the "who" anyway! Death in Venice - I absolutely love that movie. Ah, such deliciousness in this story! First I was tasting the finest Viennese Sacher Torte in my imagination, then marveling at the swift perfection of a mechanically perfect evening performance, then laughing at the projected fire. But I think my favourite part was your own film night involving the white sheet. And when you say Heath Robinson, I can imagine the most wonderful contraptions and inventions, using simple everyday items to turn out the most magnificent creations. How I loved the Professor Brainstorm books as a child (and, indeed, how much I enjoyed reading them to my own children), the reason largely being the sheer brilliance of Heath Robinson's illustrations. So sometimes entertainment involving simplicity can be just as fabulous as that involving mechanical perfection. Now if we are to take seriously anyone's advice and opinion over coffee and related matters, then it must surely be yours. We shall most certainly pass on what you say here to Zoli and Viktor when, as it happens, we shall see them later today at a party, together with the Irish ambassador and his wife [this last piece of information solely to inform you that your country continues to be represented here!!]. Oh, the days of air travel where a ticket to a foreign clime could be obtained for as little as £2. Today it scarcely buys a cup of coffee. Yes, Austria is a most attractive and interesting country and we are so fortunate to have it virtually on our doorstep, particularly Vienna which is so accessible from Budapest. Like you, we were very taken with the 'spectacle case' when we first saw it - both practical and decorative and, of course, as everything about their apartment, most stylish. Ye, 'Death in Venice' is one of our all time favourite films but, so very sad. Please, Virginia, believe us when we say that we did not in any way exaggerate the Heath Robinson nature of our own film projection. Although the boys when they saw the arrangement said nothing, their silence spoke volumes. We are delighted that you know of the Heath Robinson drawings - we are possibly three of a small minority!! I love the visualisation you created for me in your description of your Austrian friends, and then your reciprical movie night! Zoli and Viktor's stylish, immaculate apartment is something I will dream about in winter when faced with acres of mud outside and paw prints on the kitchen floor. I do have one thing in common with your friends though, I haven't yet found a city I love more than Vienna. Your film night outdoors sounds such fun, I like the idea of the burning fire perhaps I could try projecting some sunshine here! We are so pleased that you have enjoyed the post. Zoli and Viktor are Hungarian and also live in Budapest, making film nights which go on until the early hours a possibility. This sounds like a magical friendship, and those movie nights are such a cozy and splendid way to spend time with dear friends! I have yet to see either film, but thank you (! ), I will be adding them to my list of must-sees. And the mention above of Sacher Torte..so delicious, one of my favorites. Austrian people, in my personal experience, have always been very polite and friendly. My personal style, though, is FAR from minimalist! I do admire it, and think it marvelous that one can live with such clean lines. I need my beads and tassels, though! Yes, we too often dream about creating such a stylish, pared down interior. It is a real skill. We are so pleased that you have visited and enjoyed Vienna, we are lucky that it is so close that a day visit is easily achieved. What a fun idea to project some sunshine! !Thankfully, we have not had need of that in Budapest. Yes, we regard ourselves as very fortunate in being able to call Zoli and Viktor our friends. Although different in so many ways, we share a common sense of fun and adventure which is uplifting. We are delighted to read that you have visited and enjoyed Vienna, although we should have to say that the Italian coffee produced by our friends is the best we have ever tasted. Wishing you too a happy and relaxing weekend! What an evening this must have been to view such a gem of a film the OLD FASHIONED WAY indeed. A wrinkled sheet, popcorn, old memories are what I see in my mind when you mention this soirée for my dear dad would show the same home movies in this fashion. And thank YOU for your visit and kind words about my writing style. That is so important for me for I love words to scantly describe the world the way I SEE IT..simply, as clearly as I can, and hopefully, with love. We rather fear that we are old fashioned in most things, hence the need for younger friends, such as Zoli and Viktor, to keep one in touch with the ways of the modern world and keep one's eyes open to new and exciting possibilities. We BOTH enjoy your posts very much and sang along with Judy Garland this morning!! Happy weekend. I love you guys. Sorry I have not visited for a while. There is no problem. You are always welcome as and when and, what is more, we do know how your time is taken up. Vienna is a wonderful city but, dare we say it, you may possibly prefer Budapest - far less controlled!! I thought that Stockholm couldn't be beat for its cleanliness and aesthetics,but Vienna looks to be quite in the running. I don't like coffee, but I love that machine! Hello! It looks like that the Austria has beautiful nature! Thank You very much for beautiful posts! How very interesting that your friend was involved with the production of 'Secretary'. Yes, visually stunning and a film that once seen is surely never forgotten. So much to talk about afterwards made it a perfect choice for a film night! We have never been to Stockholm and so must reserve judgement. We are sure,though, that you would find Vienna interesting in a number of different ways. The coffee machine is wonderful and does indeed produce the most delicious coffee but operating it is a work of art in itself! Thank you. The Austrian countryside is indeed very beautiful. Austria does sound wonderful, and it is high up on my list of Must Sees. Sounds like a lovely evening at your friends. And of course Vienna is marvellous. But I wonder have your friends been to Zurich - even cleaner than Vienna and a countryside with few rivals. Even Tomas Mann, as you say, author of Death in Venice, choose Zurich as his favourite German speaking city. His final resting place is just five minutes from my house. The outdoor film night was indeed wonderful but we fear that the nights are becoming rather chilly these days and so, sadly, future ones may well have to be indoors. As we write we suspect that the delights of Austria may be on the wane for our friends and certainly Switzerland, although not so instantly accessible, does hold an appeal for Zoli and Viktor. We are not certain if they have ever been to Zurich but we are sure that they shall see your recommendation and may well follow it up if they have not already done so. Austria has always been a country that I would love to visit. It's just so rich in history. What a beautiful coffee machine - and as far as I'm concerned, German engineering is tops! Also, thank you for your kind words about my mom, she will be forever missed and in our hearts. Austria is a country well worth visiting, as are so many of the countries of Central Europe, each with its own clearly defined character. As for the coffee machine, we have considered stealing it. Tea, coffee and Baklava and we shall never be away......be afraid, Becky, be very afraid!!! Hoping your week is also good!! Unfortunately, our travels have not yet taken me and Macabry to Austria, but I fear that Switzerland might be closing in for the Cleanliness-Efficiency award! Well, we suspect that you could be right in this respect. 'The Boys' also like Switzerland and we have always thought it to be a country of beautiful scenery and high efficiency. So, yes, a close call!! How very, very kind of you to think of us, Susan, and afford us the honour of this award. When we started our blog we did promise ourselves that we would only write for ourselves, hopefully on topics that others might enjoy reading,but not to be part of any awards or memes. And so, to date, we have had to decline several kindnesses that others have been gracious to bestow upon us. Sadly, therefore, we must decline your offer of the award. We are delighted that you enjoy what we write and we too very much enjoy our visits to 'The View from Here' which we shall hurry over to right now. Thank you, once again. Dear Jane and Lance, please forgive me I am a little behind with my replies, so if you don't mind I will reply to both of your lovely comments at once. Firstly, I am so glad that I have your approval for the Living room plans, being such a stylish pair I would hate not to have your seal on the job! I'm glad that you enjoyed the back and white images. Linda, you have such a wonderful eye for colour and composition that you certainly do not need any input from us. Far from it.....we feel that we only lead people astray when it comes to interior decoration. Hydrangea heads do last a marvellously long time and, in our view, the colour gets better and better as they age. They looked wonderful in your vase. May we steal it when we come to tea?!!! Ooh, I wish I could have joined you! Sounds delightful. Austria is indeed magical. I once heard a string quartet play Mozart in a castle near Salzburg. A treasured memory indeed. It sounds like you had an absolutely lovely evening! A home movie screening with friends is so much fun, and something I rarely have the chance to do these days. The Adagietto movement of Mahler's Symphony No. 5 is one of my favourite pieces of music of all time (after Beethoven's Piano Concerto No. 5). Well, we understand that Marlene Dietrich referred to Jean Gabin as the 'true love of my life'so you will be in good company as you look at his films again! Why not have a Jean Gabin film night [or film week for that matter]. It may well rival the Toronto Festival!! Listening to Mozart in a castle near Salzburg sounds idyllic, Pamela. A treasured memory indeed we should think.